The news cycle has pushed the earthquake in Japan off the headlines, but the immensity of the suffering is impossible to dismiss as we are told that the death toll of the tsunami exceeds 10,000. 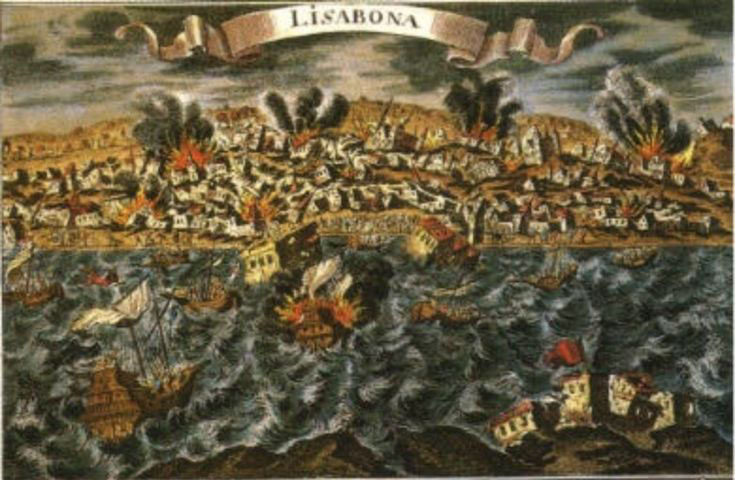 I keep being reminded of another major natural catastrophe: the Lisbon earthquake of 1755. It happened in the morning of the 1st of the November, the Catholic Feast of All Saints. Most of the city inhabitants were attending Mass in its many churches when the tremors were first felt. Modern seismologists peg the Lisbon Earthquake at 9 on the Richter scale, in the same range as the recent one in Japan. Another similarity is that the epicenter of the quake was situated offshore. This triggered a tsunami that completely emptied the Lisbon harbor before rushing back, like a “mountain of water” to sweep the lower parts of the city. Earthquake survivors who had gathered in the port drowned, ships were overturned and broken like toys. In other districts, fires, stoked by high winds, devastated whatever remained standing. Looters soon began their grisly work. Those who would get caught were hanged, and left to rot on scaffolds for the edification of the others. Aftershocks pursued the destruction of the city for months. The death toll remains impossible to establish with any certainty. It was at least in the tens of thousands (Lisbon was a city of 200,000) with some estimates as high as 100,000. Here is an eyewitness account. Human resilience, as usual, carried the day. King Joseph I and his chief minister, the Marquis of Pombal, decided against restoring central Lisbon. Instead the ruins were pulled down and all new construction was engineered to newly-minted earthquake-proof standards. Typical of the 18th century, and its unquenchable thirst for scientific experiment and its practical applications. The psychological impact was tremendous, in Portugal of course, but also throughout Europe when the news of the devastation reached the rest of the Continent. The King of Portugal himself refused to live again in a palace and installed his court in a sprawling tent city outside his capital. The current of philosophical optimism that had characterized the Elightenment was suddenly shaken, so to speak, to its core.